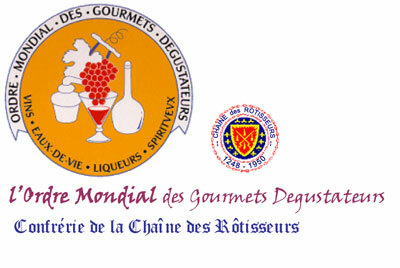 L’Ordre Mondial is a group within the Chaine des Rotisseurs whose members have a special interest in wine, beer and spirits. Where the Chaine des Rotisseurs celebrates the culinary achievements and interests of our members L’Ordre Mondial celebrates the achievements and interests of our members in the field of wine, beer and spirits. L’Order Mondial also plays an active role developing and promoting young industry professionals through our annual international Young Sommeliers competition. L’Ordre Mondial events are focused on exploring and learning about wine, beer or spirits with the food playing an accompanying role. A majority of the events have an educational component where members have the opportunity to learn more about the ever changing and infinitely complex world of wine, beer and spirits. From Old World to New World wines, from Pilsner to Ale and from Scotch to Sake we enjoy exploring all aspects of wine, beer and spirits. Any member in good standing of the Chaine des Rotisseurs may apply for membership in L’Ordre Mondial. Our membership is full of enthusiastic individuals with a passion for the drinks on our tables, whether they are beverage professionals, distributors or producers or simply “amateurs” with a thirst for learning all about these terrific beverages. L’Ordre Mondial was founded in Paris in 1963 and has become an integral part of the Chaine des Rotisseurs since its inception. L’Ordre Mondial events are scheduled throughout the year and tend to be smaller and less formal than the Diner Amicals. L’Ordre Mondial events are perfect for those members of the Chaine des Rotisseurs who want to learn about, and experience, all the world of fine beverages has to offer. I hope to see you at the table!